Hey guys, something a little different this week! 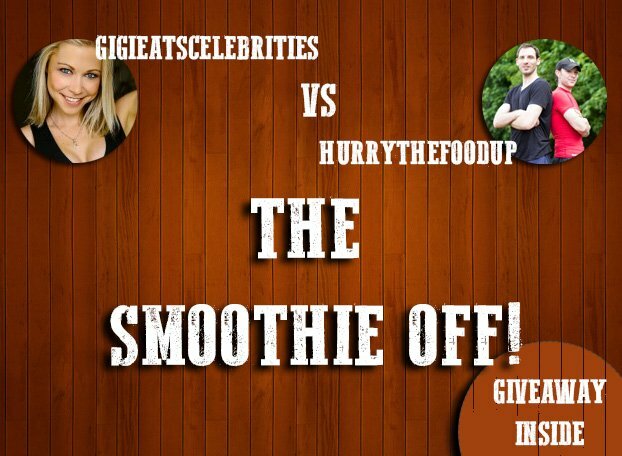 We’re having a Smoothie Off against Gigi at GigiEatsCelebrities.com, and as the name might imply, it’s one smoothie versus another. Facing off. Ready to be drunk for its cause. As many of us are, I’m sure. 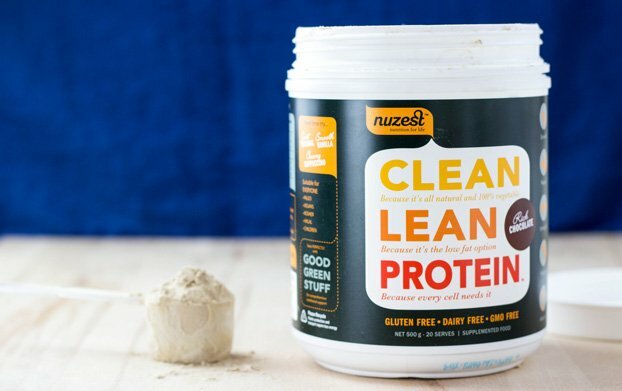 This epic competition is being sponsored by the lovely people over at NuZest, and they’ve proudly supplied the protein powders used in the recipes. You can enter the giveaway below by leaving a comment to tell us which smoothie you prefer for the chance to win 2 X 500g (17.6oz) containers of Clean Lean Protein all to yourself. Simple really. The Smoothie Off rules are simple too. Each team makes a smoothie in any way they want, shares the recipe and waits for the votes to come in. It’s HurryTheFoodUp.com against GigiEatsCelebrities.com. The reason smoothies are so unendingly popular is because of all time classics like this. This creamy high protein recipe is both delicious and nutritious. 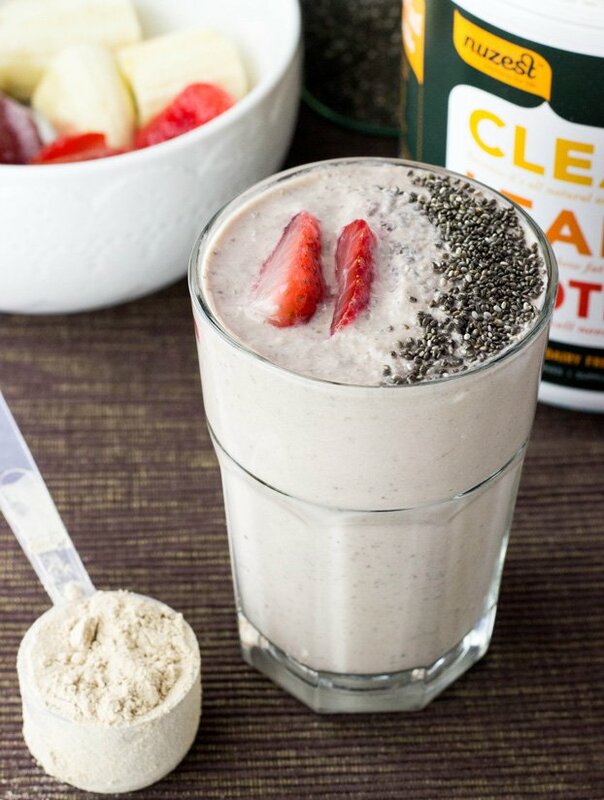 Put all of the above ingredients together in your blender… And puree away! How FLIPPING SMOOTH simple this recipe?! This is Gigi’s attempt. Although it’s a very good smoothie, it’s clearly no winner. Click here to have a look anyway. This beautiful, mouth-watering treat is brought to you by yours truly. A classic winning combination of juicy strawberries and sweet banana make this all-conquering smoothie impossible to look past. We love our food (drink?) delicious and nutritious, and this is a nutrient powerhouse. One of the joys and reasons for the ever-lasting popularity of smoothies lies in the simplicity of it all. Just throw all the ingredients into a blender (peel the banana first ;)) and press the magic button. If smoothie is too thick, add some water. If it’s how you like it, serve! Just leave a comment stating which smoothie you find more intriguing and you’re in the raffle! So there we have it. A big thanks to NuZest for sponsoring this competition: you can check out their products over here. Oh, and we got them to create a cool discount for you too – use the coupon code hgcomp20 for a 20% discount! 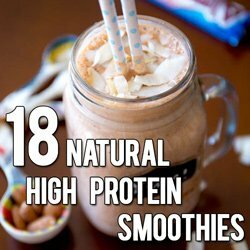 Their great tasting protein powder is 100% vegetable too. Yay! We can’t do dairy in our house, but I’ve added sour cream to a smoothie before. That may take the place of the cottage cheese. 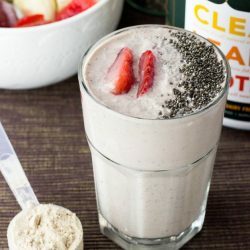 I would definitely try the Strawberry Banana recipe but not too sure about the cauli one. Chocolate, strawberries, and cottage cheese sounds like an awesome combination. I’d probably name it something like chocolate-covered strawberry cheesecake. Very “Valentine’s Day”-esque flavors. I’ve been using my blender for soups, tofu puddings, and hummus lately. Once the weather gets warmer, it will be back to smoothies and protein ice cream. Anything with the word ‘cheesecake’ in it is a winner in my book 🙂 Sounds like you’re keeping that blender busy Jordan, good stuff! What a great smoothie flavor! You win! There’s no way I can decide! I love smoothies so I’d love to try them both!! I mean cheesecake, yes. But she has cake balls. It’s a neck in neck to me! Ugh! I was all in it for you to win it, then I saw that you used cottage cheese. I’ve never liked it. And I’ll have to try to find vegan cottage cheese now. I’m starting to think that raw cauliflower in a smoothie might be better than it sounds. Can I substitute vegan ricotta cheese? Please! I want the fruity flavor of yours because berries. But I like Gigi’s cake balls because toppings. So can I get a hybrid please? I vote for a hybrid… love the high protein of the second one with cottage cheese, but I also really like the idea of adding frozen cauliflower. I’m going to have to try that one! Two fantastic smoothies and what a fun concept. 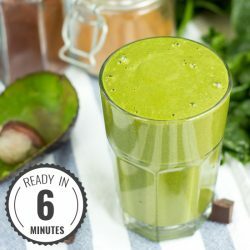 I’ve never seen a smoothie off before! And those chocolate cake balls look divine! Definitely the cottage cheese and strawberry one! Sounds delish for breakfast. 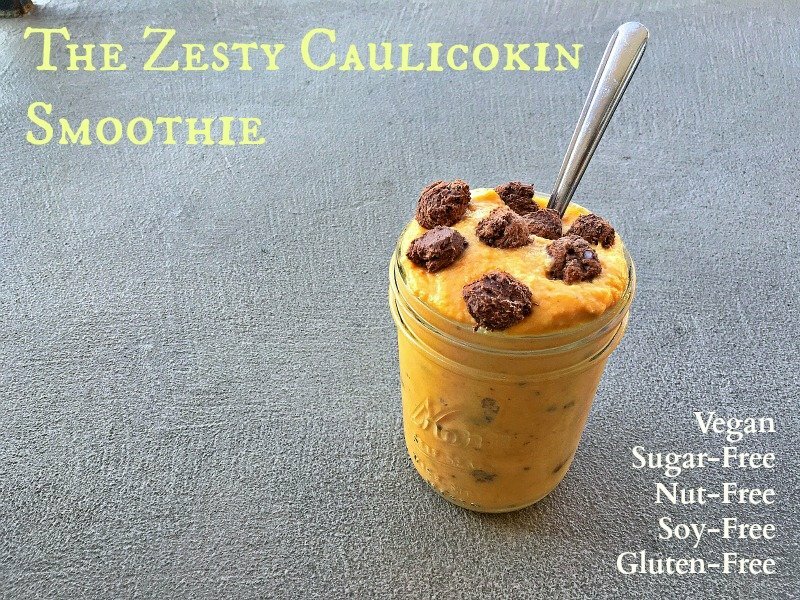 Cauliflower, pumpkin, chocolate balls….no thanks :/ I’d try a sip from someone elses but I don’t think I’ll ever be compelled to make that for myself lol. The only way I like cauliflower is roasted. I love the cottage cheese strawberry smoothie! It seems like it would be so creamy with the cottage cheese and coconut milk blended together, what a treat 🙂 I’ll have to try that for breakfast tomorrow but I can already say it’s my favourite of the two! I would deff try them both. The cauli one intrigues me, absolutely. The other one is more practical and reality in my buddy, fast paced world. Thx for the recipes!! I would change the coconut milk to Unsweetened almond milk (just preference). I definitely want to try the cottage cheese and strawberry smoothie. Sounds delicious. I def want the cauliflower balls in my mouth!!!!! That cake balls recipe rocks and I’ll be making those for my “cheat” this week. Only because I know I won’t be able to eat just one! I’m dying to try this new plant based protein. I already use two popular brands several times a day, idk how I’ve never heard of NuZest. Jesus take the wheel! !…It’s yummy protein packed cauliflower balls for me! I’ll have your smoothie with a side of Gigi’s cake balls. Yum!! Both sound like a breakfast that I’d love to wake up to. Haha! A smoothie off! What a clever idea. 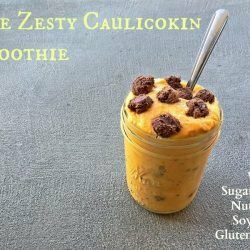 I have to say that the Caulicolkin smoothie looks very delicious. 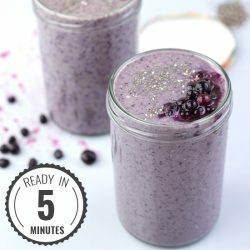 I have never tried putting cauliflower in my smoothies. This is a must try for me. Well yours is more traditional, so I’d go for yours! I don’t do cottage cheese, so I’d leave that out. But I hate cauliflower so I’d have to choose yours! Both are very creative though!